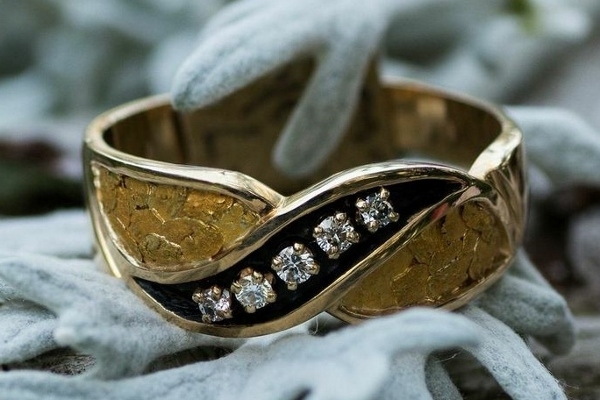 Natural Alaskan gold nuggets and diamonds set in 14kt yellow gold. Antiquing is done behind the diamonds to give this piece a unique appearance. Don't want diamonds, not a problem we can change out the diamonds for any colored stones of your choice. By using colored stones you can change this from a wedding band to a Father's ring or even a Mother's ring. Please call us today to begin discussing how to make this into a one of a kind ring for you 907-456-4991.